00:25:00 Makes 4 servings, 1 salad (306 g) each. Makes 4 servings, 1 salad (306 g) each. Vinaigrette does double duty as both a marinade and dressing in this colourful main-dish salad. Reserve 1/4 cup dressing; brush remaining dressing onto top of steak and cut-sides of peppers. Grill steak and peppers, dressing-sides down, 10 min. or until steak is medium donensss (160ºF) and peppers are crisp-tender, turning steak after 5 min. (No need to turn peppers.) Meanwhile, cover 4 serving plates with greens; top with tomatoes and onions. Cut steak across the grain into thin slices; cut peppers into strips. 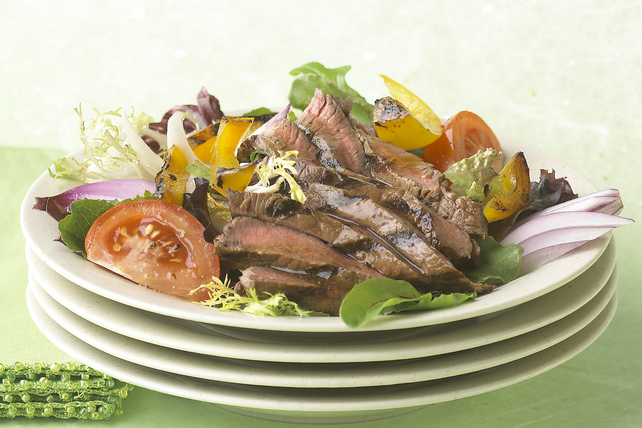 Arrange steak and peppers over salads. Drizzle with reserved dressing. Grill extra pieces of steak (or chicken) to use later in salads or sandwiches. Enjoy this colourful main-dish salad. Not only are the bright yellow peppers an excellent source of vitamin C, but the mixed greens are also an excellent source of vitamin A. Serving Size Makes 4 servings, 1 salad (306 g) each.